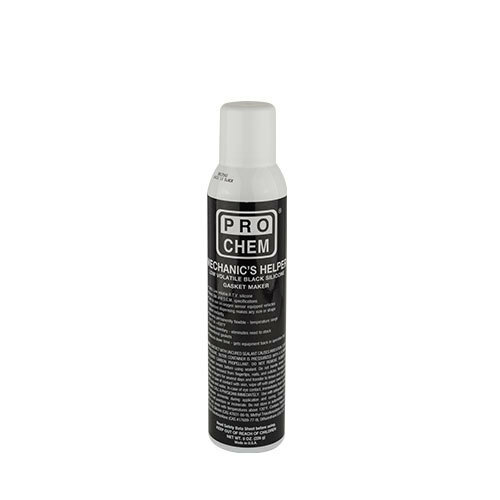 MECHANIC'S HELPER | Pro Chem, Inc.
MECHANIC’S HELPER is a premium grade, low volatile silicone gasket making material that is made from 100% RTV (room temperature vulcanizing) silicone for safe use on all oxygen sensor equipped vehicles. It replaces a wide range of cork, paper, asbestos, felt and metal gaskets. It can be used on metal, glass, ceramics, wood, rubber and most plastics. This product has excellent adhesion characteristics and high chemical resistance, and will not sag or shrink. It is impervious to temperature extremes. When fully cured and washed, meets USDA standards. Surface must be clean, dry and free of oil, tar, dirt and dust for best adhesion. Hold can at 45° angle and apply a continuous bead of 1/16” to 1/8” to the mating surface, encircling all bolt holes. For adhesion to both parts assemble immediately. For one part adhesion, allow 10 to 15 minutes for bead to skin. Assemble parts, but do not squeeze gasket out by over tightening bolts. Starts to cure immediately. Fully cures in 24 hours and reaches optimum strength in 7 days. Cylinder heads, exhaust manifolds, intake manifolds, carburetors, or continuous immersion in gasoline. Not recommended for constantly moving parts or things being stretched.